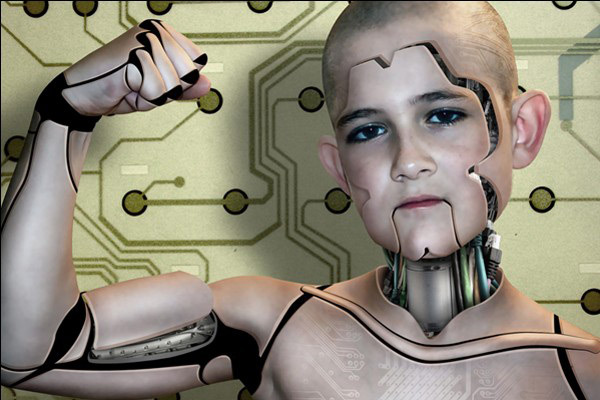 Cyborg, compound word of cybernetic and organism, is a fictional character that is integration of artificial and natural systems. 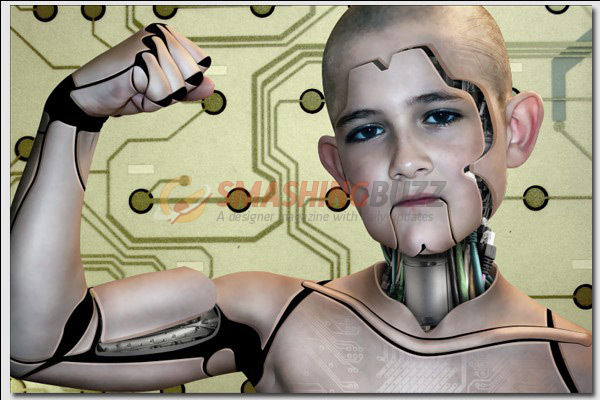 A cyborg referred to a human being with bodily functions aided or controlled by technological devices with superhuman strength and durability. 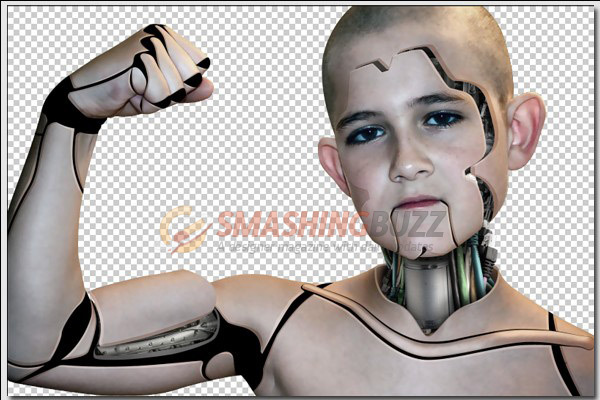 In this Photoshop Photo Manipulation Tutorial we will learn to manipulate a photo of a boy into a cyborg. We will add some electronic and mechanical elements to the body using manipulating technique. Let’s begin! The following assets will be needed to follow this tutorial. See My Muscle – from S Braswell (LilGoldWmn) on Stock.Xchng. 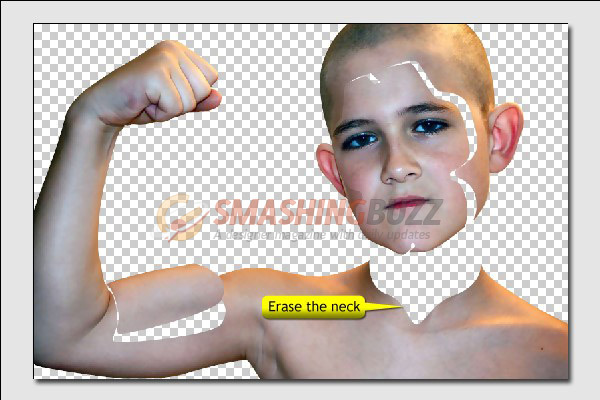 Download the stock “See My Muscle” and open it in Adobe Photoshop. Create a path on the edge of the body using Pen Tool (P) and “Cmd/Ctrl + Enter” to convert path into selection and then hit “Cmd/Ctrl + J” to duplicate the body to a new layer. Then delete or hide the original (Background layer). We’ll going to smoother the surface of the skin. Go to menu Filter > Blur > Surface Blur, use radius 5 pixels and threshold 10 levels. In this way, we smoothed the skin without blurring the edge. 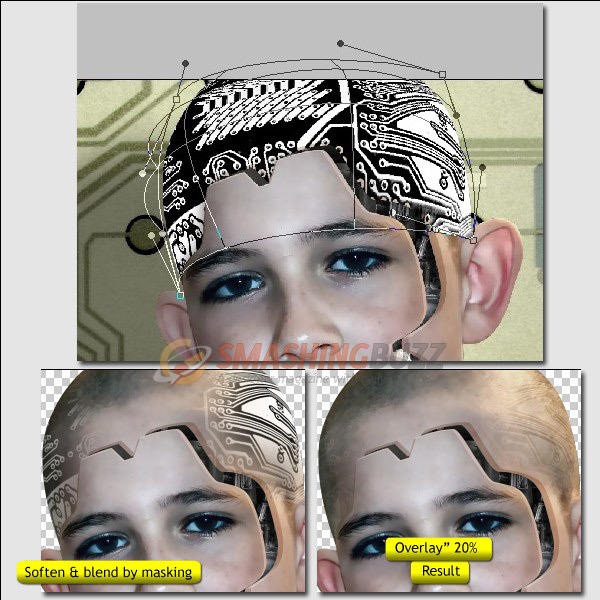 Draw this path on the face using Pen Tool (P), then make selection and create layer via cut. 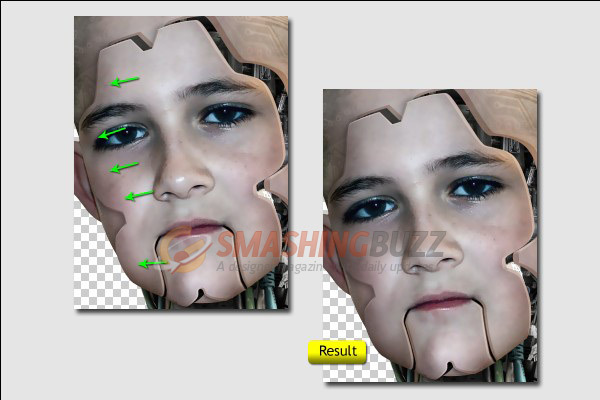 Drag the cut of face to the left to create a place we’re going to add mechanical part. And also do it to the arm, like you did with the head. Make selection and drag the upper arm upward to show the inside of the arm. Next up, the neck. 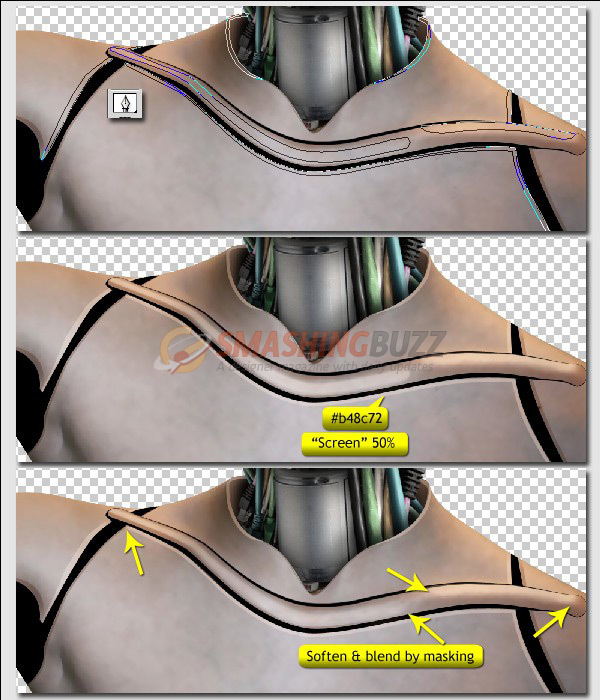 Erase the neck part using selection, we’ll replace it with some cables and machine. 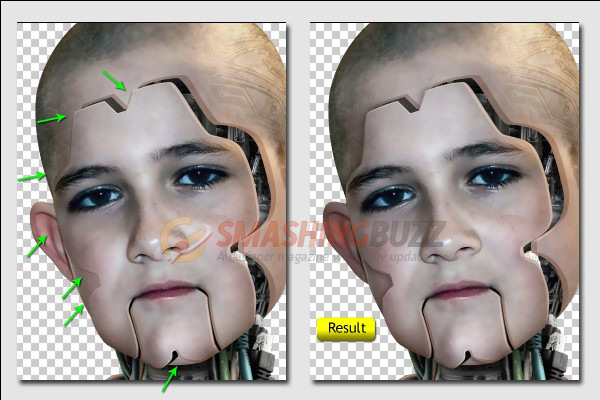 Grab the “Engine” photo, resize and place it behind the head. And then hide unnecessary parts, that is located in the outside of the head. 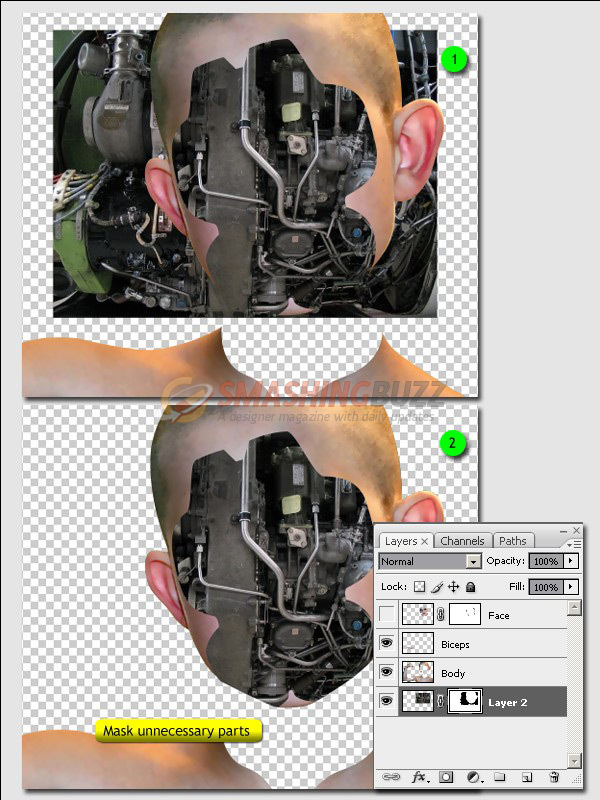 Create a new layer above the “Engine” with “Multiply” blending mode and create clipping mask (“Cmd + Opt + G” / “Ctrl + Alt + G”). Then use soft round brush with 0% opacity and low opacity to paint black brush on the new layer. 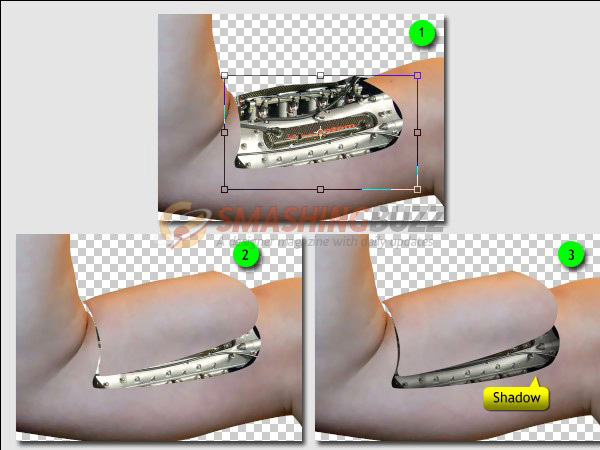 For the arm, use “Indy Car Cutaway” image stock. Take the needed part, and you have to flip it horizontal in order to get right view. 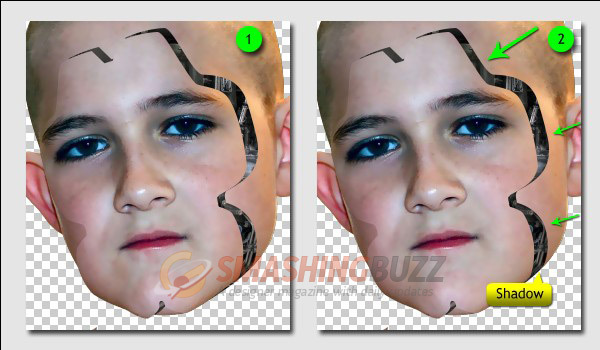 After that, paint the shadow on a new clipping masked layer using soft round brush like you did on the head. 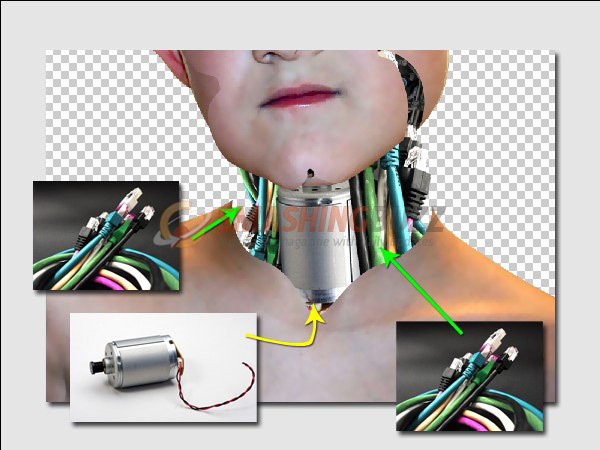 Take images stocks “DC Motor” and “Cables”, remove their backgrounds, put them behind the “Body” layer, exactly inside the neck and transform them into right proportion. Create a new clipping masked layer above “Cables” layer with “Multiply” blending mode, and paint the shadow using soft round brush with low opacity and low hardness. The shadow which is near skin must be thicker in order to get effect if the cables are really contact with the skin. And do the same way for “DC Motor” and another “Cables”. Then manage them by grouping. Create a new layer and put it behind them all. Make selection like following image and fill it with #b48c72. 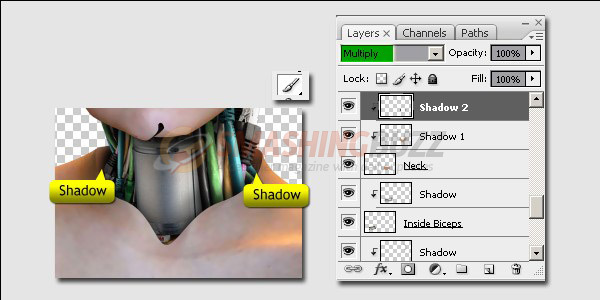 Next, create a new layer above it and create clipping mask, name it “Shadow 1″ and change the blending mode to “Multiply”. Use soft round brush to paint #b48c72 shadow. Select the top layer and then click menu Layer > New Adjusment Layer > Hue/Saturation. Set the saturation to -45. 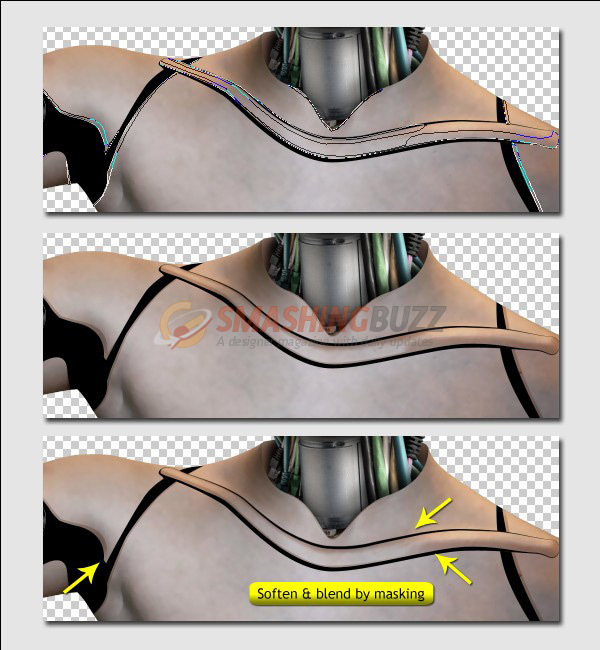 To make an illusion of cyberflesh being prefabricated before being applied to the cyborg, we’re going to create seam lines. And for particular sections we will create wider objects than just line. Now use “Cmd/Ctrl + Shift + N” to create a new layer, and name it “Joint”. Create closed paths using Pen Tool (P), then right click and select “Fill Path” with black. Here the other black areas. Use a Layer Mask to soften the ends of the shadows (click Layer Mask icon at the bottom of the layers palette), use soft round Brush to gently blend (set foreground to black). Also do that on the other sections. Here is the result of shadowing. Repeat the methods to create highlights. Use #b48c72 color and 50% layer opacity, but set the blending mode to “Screen”. And the highlights are located at the opposite sides of the shadows. Don’t forget to soften and blend by masking. There is a special place, that is highlight for the “Joint”. Set color to #a7a7a7 for it. 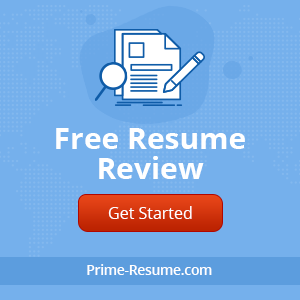 You can find it on the following image. And here are the highlights for the hand. Perform dodging on the areas that pointed by yellow arrows and burning on the areas pointed by green arrows. Use low exposure (10% – 30%) and 0% hardness. 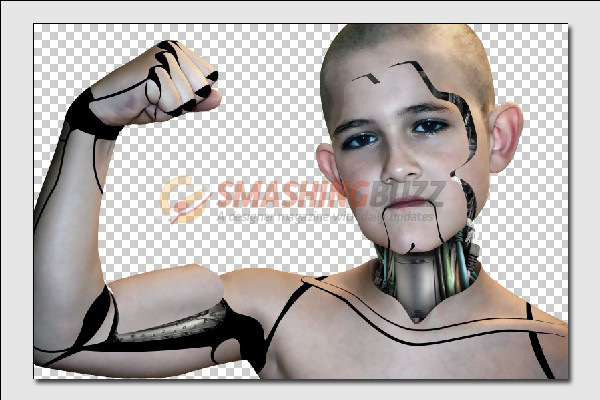 Take the “Electronics” image stock and place it on the body and transform it into right proportion. 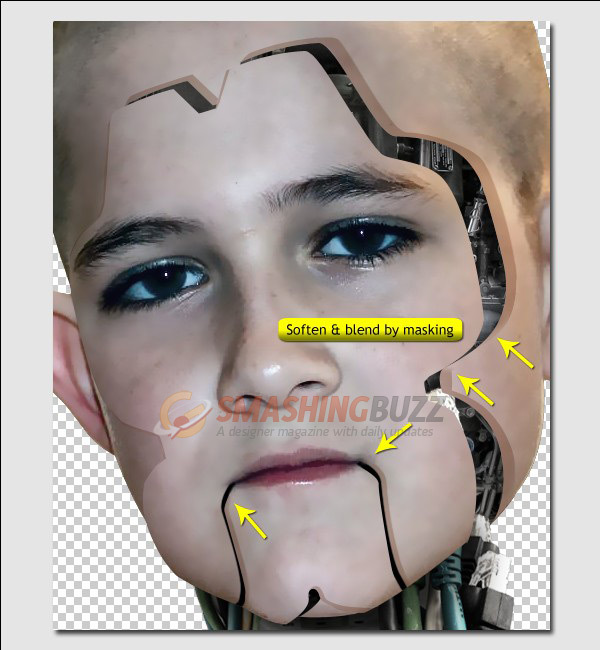 Then use layer mask to soften and blend the edge of circuit board to the body. After that, change the blending mode to “Overlay” and reduce the layer opacity to 20%. Repeat the methods for the head, and you will need to wrap it while transforming. 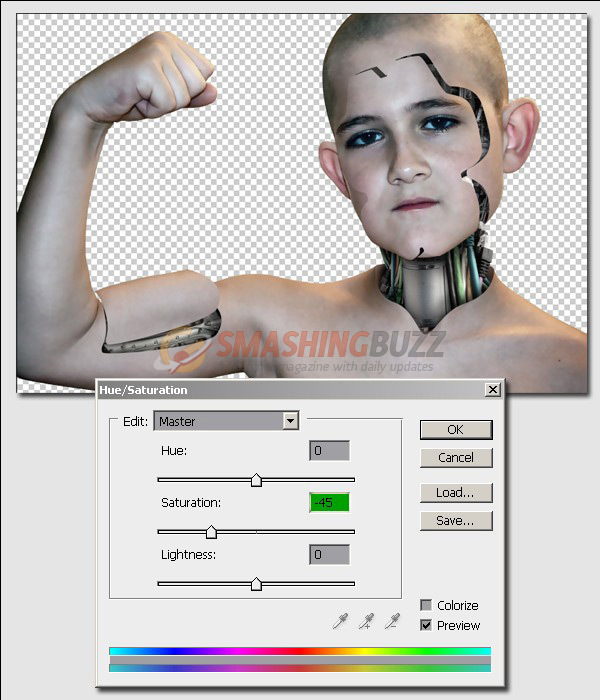 Create a new layer above the body (Cmd/Ctrl + Shift + N), set blending mode to “Multiply” and create clipping mask (“Cmd + Opt + G” / “Ctrl + Alt + G”). Grab Brush Tool (B), set low opacity and 0% hardness, paint black shadow on the areas pointed by green arrows below. Do the same way for the “Face” layer. Hide the “Background”, select a layer and create stamp visible (“Cmd + Opt + Shift + E” / “Ctrl + Alt + Shift + E”). Rename it with “Shadow” and create selection from it and fill with black. Then aplly Gaussian Blur with radius 35 pixels. 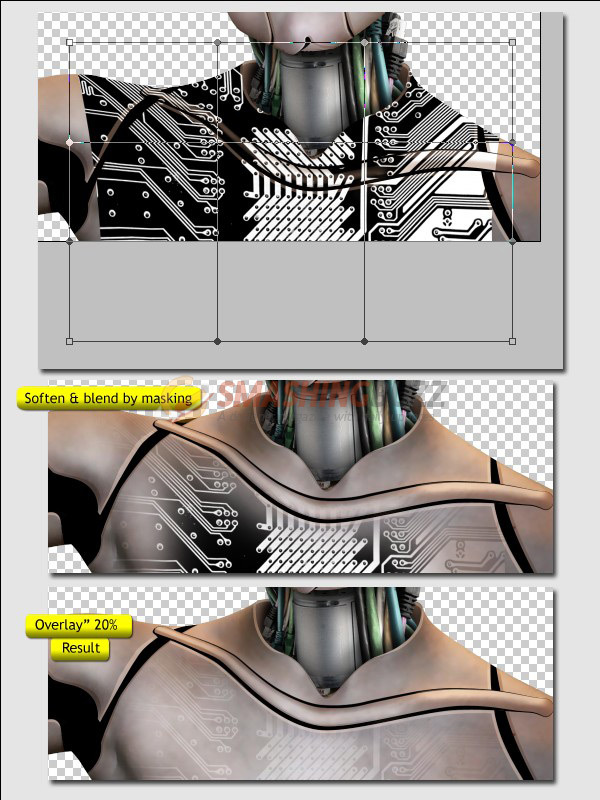 Order this layer to back of all body part (in front of the “Background”). 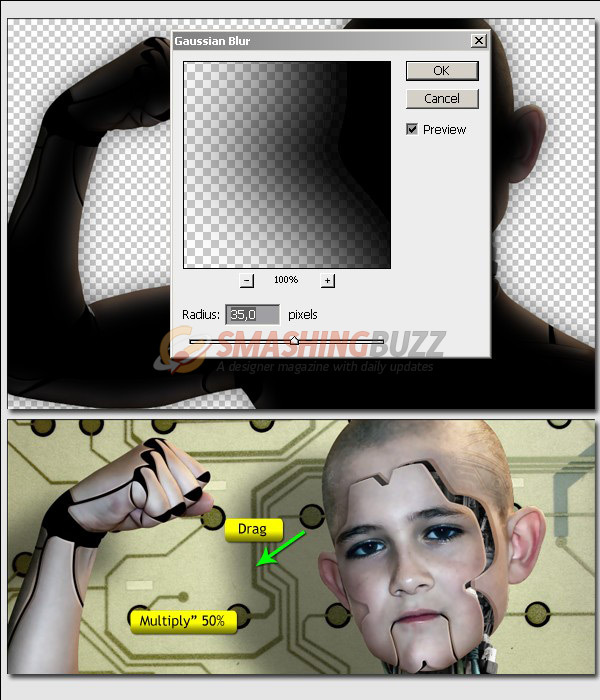 Change the blending mode to “Multiply” and reduce the opacity to 50%. After that, drag it using Move Tool (V) to bottom left. Done! And this is the final image of the tutorial.